Apple has been taking its time getting QuickTime 3.0 released. As of this writing in late January, the public developers' (pre-release) beta test of Apple's new multimedia architecture software has been underway since November. Now in version 3.0b11, software features continue to change. Not Just the Pi: Perhaps Apple took a hunt from the wisdom of the Washington Apple Pi Penguins and adopted a "Penguin at Work" for the logo of its QuickTime 3.0 development project. 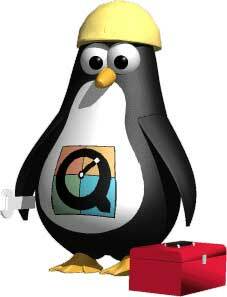 This working penguin appears all over Apple's QuickTime 3.0 web site. QuickTime 3.0 was announced by Apple nearly a year ago, and though it has never gone to general release, QuickTime 3.0 has received several broadcast and new media industry awards. Perhaps it will become the most lauded "vaporware" in software history. All of QuickTime 3.0: With no fewer than 18 elements taking more than 12 megabytes of disk space, QuickTime has grown to encompass what's called a "media layer." Beyond the browser plug-in, MIDI, MPEG and VR elements, notable in the new version is the integral installation of QuickDraw 3D. This screen shot is from QuickTime 3b11 installer setup. At January's MacWorld Expo in San Francisco, Apple announced a new video format and two new audio formats for QuickTime 3.0. These new compression-decompression tools (codecs) include Sorenson Vision for video, QDesign for music, and QUALCOMM PureVoice for voice audio. All three new codecs will allow Web authors to create better looking and sounding movies for delivery in low-bandwidth dial-up situations. These tools will also open new quality vistas for CD-ROM publishers and those pointing movies to the imminent DVD (digital video disk) format. In late December, Apple also licensed Roland's Sound Canvas sound set and an enhanced 128-instrument "GS" toolset from Roland for movies using the QuickTime MIDI music track. These apparently are planned as replacements for the existing Roland-based MIDI instrument set now in QuickTime 2.5. Apple also announced at Expo that QuickTime will split in two, with a "basic" version that's still free, and a $29.99 "Pro" version with editing capabilities. No specifics have emerged on what will be included in this Pro package, as its only mention was during Steve Jobs' Expo speech, according to MacWeek. Sorenson Vision of Salt Lake City, UT, (sales@s-vision.com) has created a video codec of same name developed in conjunction with Terran Interactive of San Jose, CA, creator of Media Cleaner Pro, a popular and highly-regarded QuickTime compression program. Sorenson Vision: The first major enhancement in video quality in years for QuickTime, Sorenson Vision offers higher quality than the existing Cinepak codec. This is the options setup box you will see when exporting movies to QuickTime via Movie Player 3.0. Sorenson demonstration movies posted at Terran's website (www.terran-int.com) show spectacular video quality at files sizes significantly below what has been possible before. Until now the leading software tool within QuickTime for compressing CD-ROM and Web video has been Cinepak, developed in 1992 by SuperMac (since assimilated by Radius). In general, my own tests have revealed that Sorenson will provide video quality equal to Cinepak at one-quarter the data rate per second or file size. The latest QuickTime 3.0 b11 includes Sorenson and you can create and play movies with it. Further, you can scale up or "frame-double" Sorenson movies easily for larger-size playback, and quality suffers little compared to Cinepak. It is possible, for example, to compress movies with Sorenson that will scale from 320x240 up to full screen 640x480 at 15 frames per second with data rates less than 100kb/sec. Older 2x CD-ROM drives will support playback of these movies. Also, combining Movie Player 3.0 with Sorenson produces stunning "slide shows" or still-frame sequences in file sizes half that previously possible with the standard Photo-JPEG codec built into QuickTime. That said, according to information from public web sites such as Terran Interactive's, a Sorenson decompressor will ship with QuickTime 3.0, and only a "demo" version of Sorenson's compressor will be part of the package. Sorenson Demo: In late January the existing beta 11 of QuickTime 3.0 offers a Sorenson Vision compression with a corporate logo in the corner of movies. Details are not clear whether the release version of QuickTime 3.0 will eliminate this watermark. In other words, you can play any Sorenson Vision compressed QuickTime movie with the free QuickTime engine and Apple's Movie Player, but apparently the free version of the Sorenson compressor will place a watermark Sorenson logo in the lower corner of movies. Alas, at last report, if one wants to compress Sorenson codec movies without watermark logo, you will have to buy the Sorenson codec developer edition. Last price I saw quoted on Terran's web site was $499, this for the ability to create cross-platform Mac and Windows-playable movies. It's been difficult to pin down what features and tools Apple plans to include in the $29.99 QuickTime 3.0 "Pro" edition. Sorenson Vision offers tools to create beautiful-looking video, but a $499 toll will keep this tool from the hands of many who want to create movies: thousands of teachers, students and home-brew movie-makers of lesser means using both PC's and Macs who through their numbers alone could create goodwill (and market share) for QuickTime and Apple. Apple desperately needs to increase market penetration of its technologies, and QuickTime may be one of its last best shots at the Windows-ruled desktop realm. One hopes someone at Apple realizes Apple and its users are all better off if Apple sells 18 copies of the QuickTime "Pro" edition at $29.99 with "non-demo" Sorenson included than selling one copy of the Sorenson compressor at $499. Smart marketing has never been an Apple strength, so I will be amazed if Sorenson Vision compression comes in the QuickTime 3.0 "Pro" version. I would love to be wrong on this. Until now, most audio under QuickTime was delivered via CD-ROM. Now developers are designing to squeeze the most audio quality from paltry bandwidth in dial-up phone connections. This to provide tools so anyone seeking an audience or a dollar can try to turn the World Wide Web into a "multimedia" experience. Most of us access the Web with dial-up phone access, and this presents problems for developers (marketers?) who want graphics and audio to make web sites attractive. Slow-loading pages are the bane of the web experience, and likely these have been burdened by too much data posing as "multimedia." Pictures, movies, GIF animations, fancy type, and audio effects all have been culprits. Part of the problem has been too many web designers who access the Web via only high-speed T1 lines and big video monitors, while too many of us users reach their web sites via dial-up connection at 28.8 and 640x480 screen size. 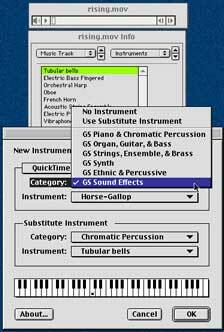 More MIDI: Apple licensed an expanded toolset of MIDI "GS" instruments from Roland for QuickTime 3.0. Once you have a MIDI file open in Movie Player 3.0, use the menu item "Get Info" to access the music track and instrument set to change instrument selections. The options for instrument selection are greatly enhanced under the new cross-platform Mac, Windows, and NT QuickTime 3.0. Enter specialty software firms, and Apple, trying to improve the "multimedia experience" for those of us still stuck in the 28.8 periphery of telecom nirvana. Apple announced no fewer than three QuickTime audio partnerships this past month, starting with the Roland MIDI GS deal in December and the QDesign and QUALCOMM partnerships at MacWorld Expo. Roland's contribution (www.rolandus.com) will enhance the MIDI instrument toolset offered by QuickTime. MIDI's advantage over regular audio files on the Web is that only instructions for playback are transferred to a user's computer. As long as instrumentation instructions reside on your computer within QuickTime, MIDI will allow download and music playback through QuickTime's synthesizer of incredible quality from tiny file sizes. This is especially so when compared to typical AIFF and other audio formats. I checked a couple of the sample MIDI files on Apple's QuickTime web site. One file runs nearly 2 1/2 minutes and occupies only 8kb of disk space. Another file ran nearly four minutes and was only 40kb in file size. If you are a web designer seeking an audio background for your site that will play continuously over 28.8 dial-up connections, MIDI could be the ticket. 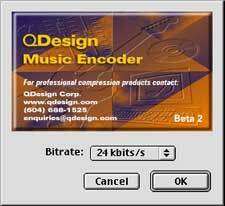 The QDesign audio codec from QDesign Corporation of Vancouver, BC, Canada, (no electronic address) is meant to preserve high quality audio containing music. For example, compact disk audio files converted to a QuickTime movie uncompressed at 16-bit stereo, 44.1khz will occupy nearly 180kb of disk space for each second of playback. QDesign's audio compression codec tries to preserve most of the audio essence in files as small as 8kb per second, or less than four percent the size of the originals. QDesign for Music: This small dialog greets when you select the new QDesign audio compression codec under QuickTime 3.0 during export from Apple's Movie Player. QDesign creates superb audio quality with music at very small file sizes. As quick test, I took a 16-bit 44.1 khz stereo audio file (theme song from the Terence Malick movie Badlands) of original size 28.5 megabytes and used the 8bk/sec. QDesign compression on it. The resulting 192kb file sounded amazingly good, especially when directly compared with the original file over large stereo speakers. Lastly, the PureVoice codec from QUALCOMM, the San Diego, CA, company that produces the Eudora email program and technology for wireless and digital telephone audio, (www.qualcomm.com and www.eudora.com) will allow creation of voice-quality QuickTime audio tracks of less than 1kb per second data rate. 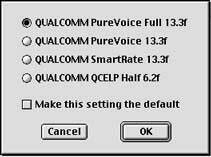 PureVoice for Voice: This dialog presents data rate and quality options when you select the QUALCOMM PureVoice for encoding voice soundtracks in QuickTime. Like QDesign's codec, PureVoice offers high quality at rates less than 1kb per second. PureVoice was originally created as a compression tool for digital and wireless telephone systems. Meant for use in delivering voice mail and newscasts, PureVoice is intended to preserve "landline" telephone quality at very small file sizes. Pure Voice will allow developers to create via QuickTime, for example, Internet-based voice mail and voice messaging systems. All this is based on QUALCOMM’s existing expertise developing technology for wireless telephony. Typically the audio quality of Pure Voice is at about 8 khz. The landscape of QuickTime's personality continues to evolve, and this is only (an ongoing) cursory look at some of the latest new features. 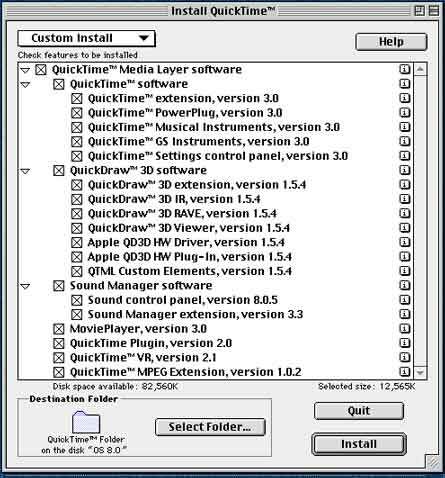 Other aspects of QuickTime are being redesigned and enhanced for version 3.0: Movie Player, the QuickTime Plug-In for Netscape and Internet Explorer, QuickTime MPEG and VR, Sound Manager and QuickDraw 3D. If you're interested in taking advantage of the new features, the latest version of QuickTime 3.0 can be found at http://www.apple.com/quicktime/. Pi Member Dennis Dimick writes from Arlington, VA and can be reached via Internet email at ddimick@aol.com.